Capturing a photo of the Aurora borealis is always fascinating especially on a clear night when the stars twinkle across the sky. 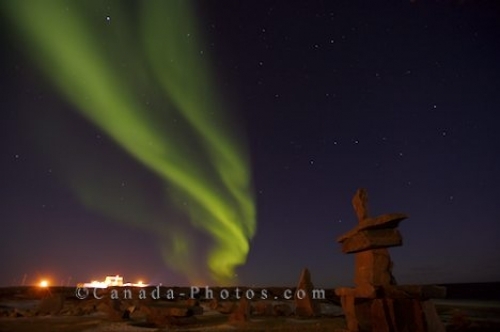 The lights from the Port of Churchill glow in the backdrop and an Inukshuk adorns the shore of the Hudson Bay as the green display of the Aurora borealis dance above. Northern Lights, Aurora borealis, above an inukshuk in the town of Churchill with the lights of the Port of Churchill glowing in the background, Hudson Bay, Manitoba, Canada. Picture of a light show from the Aurora borealis above an Inukshuk on the shore of the Hudson Bay in Churchill, Manitoba.